Recent Doubling of Floor Space at North Korean Gas Centrifuge Plant : Is North Korea doubling its enrichment capacity at Yongbyon? 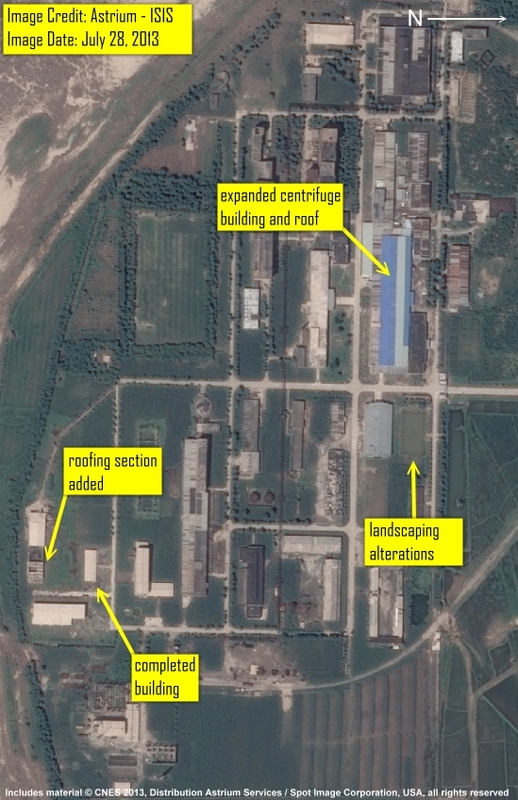 Recent satellite imagery of the Yongbyon nuclear complex in North Korea indicates that it has apparently expanded a building in the fuel fabrication complex that houses a gas centrifuge plant for uranium enrichment. The area is now covered by an extended roof that is roughly twice the size of the previous one (figures 1, 2, and 3). 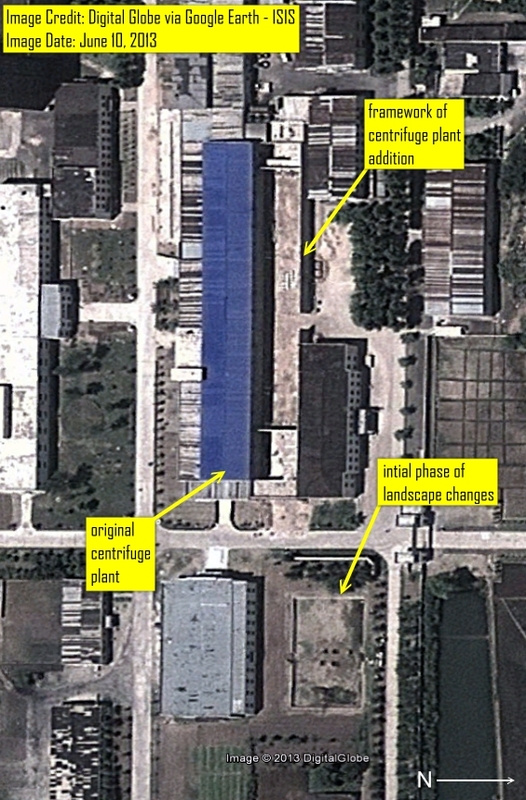 Based on the analysis of ISIS archival satellite imagery and imagery available on Google Earth, construction of the centrifuge building extension appears to have begun sometime in March 2013 (figures 2 and 3) preceding shortly the announcement by the North Korean government that it planned on “readjusting and restarting all the nuclear facilities in Yongbyon including uranium enrichment plant and 5MW graphite moderated reactor“. This announcement may have been partially intended as an oblique effort to reveal this new construction; one missed publicly at the time. The new addition to the centrifuge plant matches the overall length and width of approximately 120 x 15 square meters of the original building, effectively doubling its size. Google Earth imagery from June 10, 2013 reveals the internal floor plan of the new addition which is divided into three sections with two smaller rooms of 18x15 m2 and 9x15m2 and a larger hall of 93x15m2 (figure 2). The larger hall appears to be a cascade hall, where the centrifuges would be located. ISIS has estimated that the annual production of weapon-grade uranium (WGU) at the Yongbyon plant could have varied greatly from 4 to 17 kilograms of WGU per year per 1,000 P2-type centrifuges, with a mid-point of 11 kilograms of WGU per year per 1,000 P2 centrifuges. 4 A doubling of capacity from 2000 to 4000 centrifuges would mean that annual WGU production could increase from 8 to 34 kilograms to 16 to 68 kilograms. However, much of the enrichment output of this plant is needed to make LEU for the experimental light water reactor, thus a more realistic estimate is that doubling the capacity would allow for an increase in the production of enough weapon-grade uranium for up to two nuclear weapons per year, estimating that each weapon would require approximately 20 kilograms of weapon-grade uranium. As mentioned previously however, it is not known if North Korea intends to produce weapon-grade uranium in this facility. There are also signs of construction or landscaping in an area adjacent to the centrifuge plant. A previously empty lot was cleared and converted into what appears to be a pool. However, it is not clear if this activity is functionally related to the expansion of the centrifuge plant building (figures 1 and 2). Over the past year there has also been ongoing construction at several buildings within the southeastern corner of the fuel fabrication facility perimeter; two new buildings have been constructed, and a third building is in the process of being slowly roofed (figures 1 and 3). These new buildings are suspected to be related to fuel production for the experimental light water reactor. Figure 1. 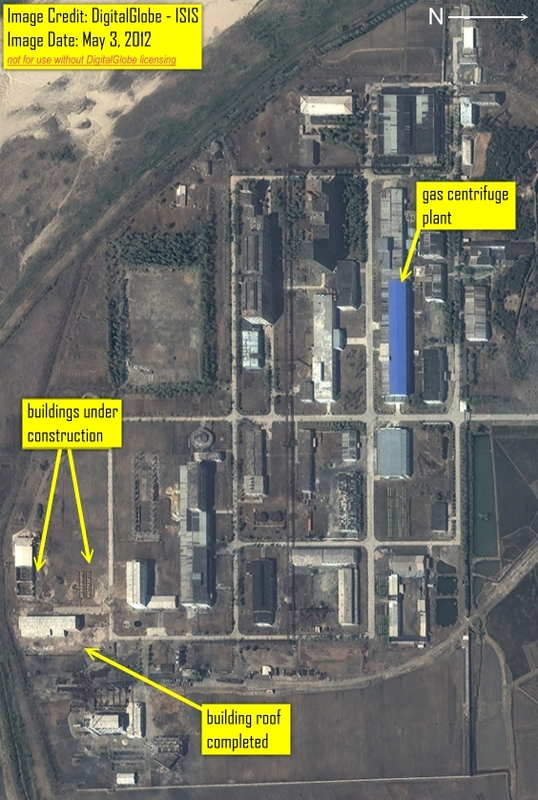 Satellite imagery of the Yongbyon Fuel Fabrication plant from July 28, 2013 showing the expansion of the gas centrifuge plant building. Figure 2. Digital Globe imagery from June 10, 2013 available on Google Earth showing the frame of the extension added to the centrifuge plant building. Also note the cleared rectangular area adjacent to the centrifuge plant. The area which had previously been an empty lot, appears to have been filled with water in the later imagery from July 28, 2013. Figure 3. Digital Globe imagery from May 3, 2012 showing building construction in what is the south eastern corner of the fuel fabrication facility. Note the empty space between the centrifuge plant building that in the recent imagery has been covered by an extension to the plant building. 1 By David Albright and Christina Walrond, North Korea’s Estimated Stocks of Plutonium and Weapon-Grade Uranium, ISIS Report, August 16, 2012. http://isis-online.org/uploads/isis-reports/documents/dprk_fissile_material_production_16Aug2012.pdf 2 Ibid. 3 Ibid. See table 5, where the value is 0-11 through 2011. 4 Ibid.